Why would I need self storage in Henderson, NV? There are a variety of reasons why you might need self-storage in Henderson, NV. How much is a storage unit in Henderson, NV? The cheapest storage unit in Henderson, NV is $38.00 per month. What size storage units do you have available in Henderson, NV? In Henderson, NV we have sizes that range from 5'x5' to 10'x30' to suit your storage needs. How much is it for a 5'x5' storage unit in Henderson, NV? The cheapest 5'x5' storage unit in Henderson, NV is $52.00 per month. Henderson is the second-largest city in Nevada, and it's considered part of the Las Vegas metropolitan area. Just 20 minutes from Las Vegas, Henderson offers easy access to all the major amenities of a large city while providing a family-friendly retreat from the bustle of city life. Henderson is best known for its master-planned communities, parks and recreation features and local amenities. It's also frequently named one of the safest cities in America. Henderson is a relatively young city, earning a place on the map with the construction of the Basic Magnesium plant during World War II. Because the city supplied a major portion of the war's so-called "miracle metal," its economy flourished. . After the war ended, Henderson found itself somewhat of an abandoned town, with many residents and local companies leaving for other cities. The area nearly became war surplus property, but was saved when the local government purchased the industrial plants. Once local industry was back up and running, the city quickly grew. The original Henderson city limits spanned just 13 square miles but expanded to the nearly 100-square miles that they are today. As Henderson grows, so does the variety of shopping, dining and entertainment options. There are a number of live music venues in the city, as well as movie theaters and casinos. The nearby Las Vegas Strip offers an easily accessible endless supply of entertainment. Many of Henderson's local attractions celebrate the city's desert setting and heritage. One is the Clark County Heritage Museum, where you can browse exhibits and artifacts that date back to Nevada's prehistoric era. The Acacia Demonstration Garden is a unique educational public park that features many different examples of plants that can thrive in Henderson's dry climate. You can walk through specialized exhibits including the allergy-friendly garden, the native garden, a cactus garden and a compost demonstration exhibit. 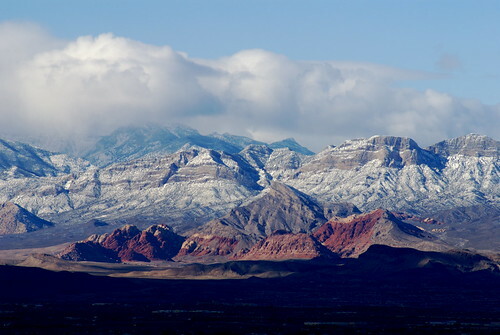 Thanks to its desert location, Henderson enjoys mild winters. As a result, you can enjoy many of the city's outdoor spaces, including the extensive hiking and biking trails, for much of the year. Green Valley is among Henderson's most affluent neighborhoods, and it was one of the first master-planned communities in southern Nevada. It's the site of Green Valley Ranch, a luxury resort and casino that offers several restaurants and a spa. Lake Las Vegas, by the 320-acre man-made lake by the same name, is dotted with several luxury hotels and resorts. The idea for the desert lake was first conceived in the 1960s, and in 1990, it was finally filled in with 3 billion gallons of water. The focal point of Black Mountain is its mountainous namesake. You can explore a number of hiking trails in the area including several family-friendly beginner trails. The Water Street District is Henderson's central historic community, offering a variety of unique shopping, dining and entertainment options. Local murals depict the history of Henderson and feature many different artists and styles. The Clark County School District serves the public elementary and secondary schools in Henderson. There are also several private schools and a specialized high school program focused on basketball. If you're going to be working towards your degree, Henderson has several different schools to choose from. Nevada State College is one of the largest in the area, and there's also a branch of the College of Southern Nevada. Utilities: NV Energy is the area's main power provider. The city manages public water and sewer services. Garbage and Recycling: Residential trash and recyclables are collected curbside, typically once a week. Transportation: RTC Transit has a network of bus routes in Henderson and the surrounding Las Vegas area. Henderson's median home price is slightly above the national average, and the market has been growing quite rapidly. The good news is that there's a large inventory of housing options to choose from, ranging from apartments to single-family homes. Our lowest priced units in Henderson, NV average $59.17 per month. 432 people have reserved units in Henderson, NV in the past 30 days. There are 6 locations within Henderson, NV's city limits. There are 6 locations in Henderson, NV that offer AC and Heating features.